The UnderDeep has a vast variety of creatures, most of which are very rarely seen by surface dwellers. A large selection of encounters can be found in published TSR ® material, such as the Monstrous Compendium. A few additional encounters are given below. Note that some are new PC races found in Fathoms: Aquatic Adventures. Note that some of the creatures below may not have graphics or text included with them yet. These will be updated shortly, as well as new creatures added. Kraynion (often called saltwater piranha) are ferocious fish who have been known to strip all the flesh of a man in seconds. They grow to about six to nine inches long and about 3 to 5 inches high. They have a large mouth (for their size) with a double row of razor sharp teeth. Their scales are a bluish-gray color. Combat: Kraynion are attracted to the scent of blood and can sense it from nearly one mile away. Kraynion will often ignore creatures who are not bleeding (60% of the time). They will nearly always attack a victim who has an open wound, however. If kraynion decide to attack an individual who is not wounded, only 1-4 will attack per round until blood is drawn, then the rest will attack on the next round. Only 20 kraynion can attack a man-sized creature per round. This decreases to 10 that can attack small creatures at one time. Most large creatures can have 100+ kraynion attack in the same round. Their size and constant motion makes them hard to hit (AC 4). Kraynion are repelled by ink from octopod and cephalopods. They will not willingly approach within 5 feet of this ink. An Ink spell will repel a school kraynion. As a result, kraynion do not eat octopus, squid, or any other animal of this type. Habitat/Society: These killer fish can be found in almost any body of salt water, but prefer to stay away from cold. There are a few animals that kraynion find inedible and will not eat. These are octopi, squid, sharks, and other kraynion. The kraynion hunt by smell of blood. As a result, any creature who remains still and is able to disguise their scent will remain undetected by these killers. Kraynion travel in schools of 10 to 100 normally, although larger groups have been seen. These fish are almost never seen alone. Ecology: Kraynion females lay their eggs in large seaweed beds. When the eggs hatch, the babies remain in the seaweed, eating the eggs and newborns of other types of fish, as well as remains of dead animals. As soon as they are old enough to hunt, the kraynion leave the seaweed to join up with a school of older fish. Kraynion must eat their weight in flesh each day to survive. Often called octofolk, these are creatures of half octopod and half human mixture. 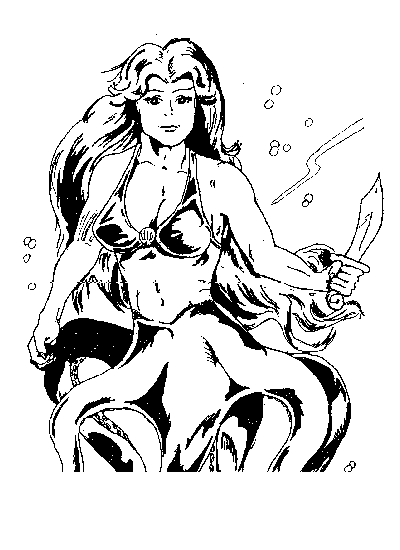 They are related to octopods in the same way merfolk are related to fish. It is speculated that, like mermen, they used to be humans that were magically transformed. Octofolk, however, are very proud of their octopod heritage. They tend to believe that mankind is a lower form of existence than the octopod, and their race is in the process of evolving into giant octopus. They are human in appearance from the waist up, and have an octopus-like body and tentacles from the waist down. Octomen come in many colors, including grey, light blue, green, brown, and flesh colored for the humanoid half, and always either black, brown, or grey for the octopod half. The males are usually hairless, while the females support long, flowing hair. Octomen move through the water by either swimming with their tentacles (Movement rate of 6), or using their exhalant siphons to provide jet propulsion. Water is taken into the mantle cavity - the space between the outer body musculature and the internal organs - and is then expelled forcefully through the siphon (providing a movment rate of 18). The tentacles are used to swim in enclosed areas and casual locomotion, while the siphons are used in long distance traveling and times when speed is needed (like during an escape). Due to the increase in appendages, all octomen receive a +4 bonus on all wrestling "to hit" rolls. If an octoman gets a hold on an enemy, they can attempt a strangulation attack on the next round, with another successful attack roll. If this roll succeeds, the victim automatically takes 2 points of damage per round until they can free themselves of the octoman. Due to the octoman's suction ability, this can be a near impossible task. The octoman can attack the victim with a weapon while they are strangling them, with a +2 bonus to hit (this is why so many carry daggers). Their relationship with octopods gives octomen a few natural spell-like abilities. They have a natural ink sack which allows them to produce the effects of the ink cloud spell once every 4 hours. They also have the natural ability to recreate the effects of the suction limbs spell at will. Note that only the appendages on the octopod part of it's body can use the suction limbs ability. If more than 30 octomen are encountered, there is a 60% chance they will be accompanied by a giant octopus (AC 7; Move 12; HD 8; # AT 7; Dmg 1-4 (x6)/2-12). For every ten octomen, there is a 10% chance of a priest (3 HD, treat as 3rd level priest), and also a 20% there will be a 4th level fighter (4 HD). For every 20 octomen, there is a 15% of a wizard (5 HD, treat as a 5th level wizard). Octomen suffer no damage from most water attacks, but double damage from fire attacks. Habitat/Society: Octomen do not live in large schools or create cities, rather all generations of a family live in one unit. The female is head of the household in octomen families. The eldest female rules the family, delegating the authority to the younger females. There is no formal marriage bond for octomen. When it is time to mate, the female finds a suitable male in another family, and returns to her family afterwards with no bonds or emotional ties. Although the females rule the family unit, the males are still highly respected. In general, the males grow larger and stockier than the females, and are considered to be the providers and protectors for the family. Each member of an octofolk family has an assigned job they perform for life, such as hunting, building, weapon-making, etc. When youths are old enough to take on a position, they are assigned to an adult as an apprentice. Octomen have a special relationship with octopods, and there will usually be hundreds or even thousands of them in a octofolk society. Each community will also have 1-4 giant octopus. Octomen and other octopod can communicate freely. Octofolk are very adept at magic, often becoming powerful priests and wizards. Little is known about octomen by surface dwellers, since they are not suited to travel out of the water. Their only form of locomotion on the surface is crawling, with a movement rate of 1. Octomen suffer 1 point of damage per turn after the first hour out of water due to dehydration. : Females usually give birth to 2 or 3 infants at once. Three-fourths of the octofolk babes are male. As soon as the children are old enough, they begin training in an area decided by the mother. Females always train the females, and males likewise teach the male youths. Octomen are carnivores that enjoy eating fish, lobster, and other small sea creatures. They do not have a parrot-like beak like most octopods, although their greater size and strength allows them to break open the shells and exoskeletons of small prey with their tentacles. Except for the coloration and the webbing on their hands and feet, quirden (also commonly called sea gnomes) are nearly indistinguishable from their surface cousins. Quirden are short and stout, nearly always supporting white or silver hair. The males often are bald atop their heads, and may let their beards grow much longer than the standard gnome. Quirden also have fleshy webbing that runs along both sides of their legs that helps them swim. This small "fin" is composed largely of muscle, and is able to fold up against the gnome's body when not in use. The skin coloring of a sea gnome ranges from green to blue to tan, but always matches some common color found in the ocean. Quirden are usually scantily clothed, covering just enough to keep them modest. The hunters and warriors often wear armor made of shells or scales, which is specially made to not impede their swimming. They speak their own language, and usually know merman, sea goblin, triton, locathan, and octofolk languages. They can also communicate with nearly all types of whales. Combat: Due to their size, quirden usually attack in numbers to overpower their enemies. As with their surface cousins, quirden have a strong hatred for goblin races. They gain a +1 to their attack rolls when attacking sea goblins. In the rare cases that they venture onto land, this bonus applies for surface goblins as well (but not kobolds, as quirden have had almost no contact with them). Quirden have no natural weaponry, but will always be found with some type of weapon. Sea gnomes prefer daggers, short swords, and nets. There is a 10% chance for every level above 4th that a quirden's armor or weapon will be magical (roll separately for each). Spellcasters have a 10% per level chance of having 1-3 magical items (not weapons or armor) usable by their character class. Sea gnomes have an unusually high resistance to magic and poison and save as if they were 4 levels higher than they really are (PC's gain a +1 bonus per 3.5 points of Constitution). Habitat/Society: Quirden are normally very peaceful creatures, fighting only when necessary. They try to maintain good relations with other sea races when possible (except goblin and sahuagin). Sea gnomes are also very fond of nature and all peaceful undersea creatures. They have a special relation with whales (especially orcas), and use them as mounts and to protect their villages. Quirden can communicate with all standard types of whales, and many nonstandard types (DM's discretion). A typical school of quirden will contain 20-200 adults (about one-half will be female) and 5-50 children (usually about 1/4 total number of adults). For every 20 quirden encountered, there will usually be a fighter of 2nd level or higher. For every 40 quirden encountered, there will be at least one cleric or illusionist of 3rd level or higher. Sea caves usually make up a quirden's village. Sea gnomes have the same abilities to detect slopes, secret passages, etc. as the standard gnome (see Players Handbook). Ecology: Quirden rarely travel to the surface, as they find it inhospitable and do not like the changing weather, temperature, etc. When they do need to travel to the surface, they usually go in the disguise of a regular gnomes, and keep their existence secret. Sea gnomes eat almost entirely seaweed and other ocean plants, although they do eat fish occasionally as a supplement to their diet. The sea goblin is a distant relative of the land-dwelling humanoids. They are slightly taller and skinnier than the surface version, and rarely leave the depths of the ocean. A sea goblin's skin color ranges from a bland yellow to a bluish-yellow. Most goblins in the same school will have similar coloration. The eyes of these goblins are large and milky white. They have no eyelids, just a layer of transparent skin to protect their eyes from damage. The fingers and elongated toes of a sea goblin have a layer of skin between them to act as webbing for swimming. The sea goblin's language consists high-pitched of whines and shrieks that can be heard for up to two miles. 10% of sea goblins can speak surface goblin. Combat: As with their surface cousins, sea goblins hate bright light. Their large eyes are very sensitive, and they get a -1 penalty on all to hit rolls when they are exposed to it. They have infravision that extends 60 feet. Sea goblins usually carry long weapons such as spears and tridents to make up for their small size and short reach. They are also skilled users of nets. During combat, sea goblins often try to net as many opponents as they can, and then finish them off with their piercing weapons. Most goblin schools have warriors who specialize in nets. These individuals get a +1 bonus on attacks with this item. 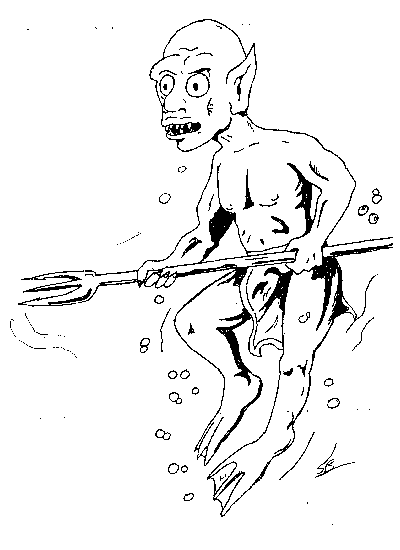 Sea goblins favorite foods are merfolk and sea elves, who they try to capture and eat fresh later. Habitat/Society: Sea goblins group themselves into schools of about 30-300. They make their homes in undersea caves and sometimes even sunken ships. They are much cleaner than their surface relatives, and usually bury their trash to avoid attracting sea beasts. 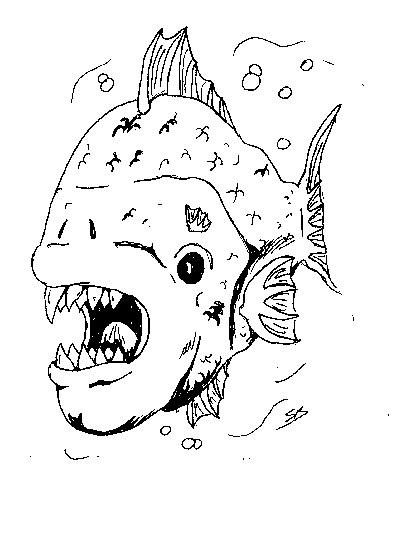 Sea goblins are great fishers, and their diet consists of almost entirely fish and shark. They will occasionally (whenever the opportunity arrives) capture humanoid races for feasts. During these feasts, the victims are usually kept alive while the goblins have a celebration. Once it comes time to eat, the captive is slain and the goblins feast immediately on the fresh meat. Sea goblins are totally merciless and without morals. Sea goblins are not family-oriented. Each member of the school has a job they do for the benefit of the community. 50% of a school are usually hunters and fishers. There are also goblins who have the sole responsibility for raising the children. Each job: building, tool-making, etc, has goblins assigned to it. Sea goblins have a maintain a relationship with other goblin schools, and often combine resources. They also have close contact with surface goblins, whom they have a regular trade network with. Since metal cannot be forged underwater, nearly all weapons come from the land goblins. In return, sea goblins provide the surface with fish, sunken treasure, and other treasures from the sea. Although sea goblins can also breathe air, they cannot survive long out of water. They take 1 point of damage from dehydration each hour they spend out of water after the first. They often board and attack ships, though. Ecology: Sea goblins, like their land cousins, live about 50 years. However, in the deadly depths of the sea, very few die from old age. Females give birth to 2-12 newborns at once. Sea goblins are born at only 6 inches tall, but grow to 2 feet within one year. Most infants are killed in the first few months of life, as they are prized food for sharks and other large fish (and even the sea goblins themselves!). The whiplash is a parasitic eel, often referred to by the UnderDeep races as the "vampire eel". This animal grows to an average length of 8 feet long and is light to dark brown in color, with jet black eyes. The eel has eyes but no mouth, and receives sustenance through draining blood from it's victims. The whiplash has a one foot long "stinger" attached to it's tail that draws blood and replaces a conventional mouth. It has a fin on it's back and underside that runs the length of it's body. This fin allows it to propel itself as it snakes through the water. Combat: The whiplash attacks by wrapping itself around the body of it's victim and attacking with the stinger on it's tail. This stinger causes 1d4 points of damage and injects a fluid that temporarily paralyzes those who fail a save versus paralyzation. If the victim makes the saving throw, they must continue to make a save every round thereafter until the stinger is removed or the whiplash is killed. The stinger can be pulled out by a successful open doors roll, but the attacker must first make a successful attack roll at -2 go get a firm hold on the tail. The tail stinger can easily be removed once the creature is dead. The tail can be severed with 6 points of damage, which is not subtracted from the creatures total hit points. On the round after the first successful attack and the tail is implanted in the victim, the whiplash will begin to draw blood. This draining will cause an additional 1d4 points of damage per round, regardless of whether the victim has been paralyzed or not. Any attacks to whiplash from the victim who is entangled are at -4 to hit unless the attacking weapon is dagger size or smaller. Habitat/Society: Whiplash are not normally aggressive creatures until it is time to feed. They will often hide among the coral reefs or seaweed and wait for victims to come within striking distance. The striking speed of a whiplash is incredibly quick, which is where they earn their name. 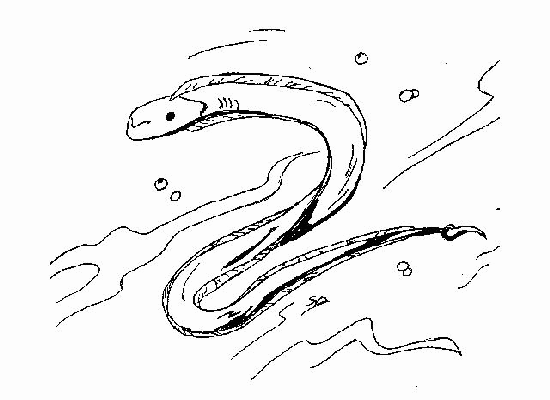 This eel has a strong regenerative ability, and can restore a severed tail within one week. They often attach themselves to whales and other large creatures, but only release enough paralyzation fluid to dull the area. They then feed from what they need and unattach themselves. Whiplash prefer the blood of humanoids. The whiplash will always attack a humanoid rather than other fish if the opportunity arrives. Ecology: Whiplash females attach their eggs to a whale or another large sea creature. When the eggs hatch, they attach to the host and receive sustenance from it until they are old enough to leave and hunt on their own (about 2 weeks). The young are about 4 inches long when born. The host usually will not know they are there, as the baby whiplash do not draw much blood and their paralyzation toxin is not very powerful.